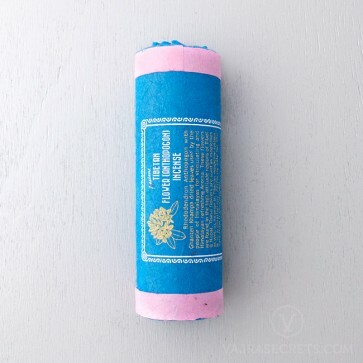 Tibetan Flower Incense Sticks are traditionally hand-rolled from natural herbs, oils and other ingredients. This exotic floral incense releases a stimulating and refreshing aroma when burnt, which is helpful for healing and aromatherapy. Tibetan Flower (Anthopogon) Incense Sticks are traditionally hand-rolled from medicinal flowers found in the high altitude regions of Tibet and Nepal such as Rhododendron Anthopogon and Gaden Khampa. This exotic floral incense releases a stimulating and refreshing aroma when burnt, which is helpful for healing and aromatherapy. It is excellent for cleansing and purifying the environment of unwanted energies and to aid relaxation and stress-relief. It is also particularly used during spiritual ceremonies and meditation sessions to create a peaceful and calm atmosphere.